Using Wipneus's regional data up to 31 July, here's a rundown of the regions in the Arctic Ocean. First the wide angle view: The whole Arctic. Extent on 31 July is in the post 2005 pack, years after that date show a consistent below average (1980 to 1999 average period) extent. 2014 is on a steep trajectory of loss, but I seriously doubt there is any prospect of near record September minimum this year. 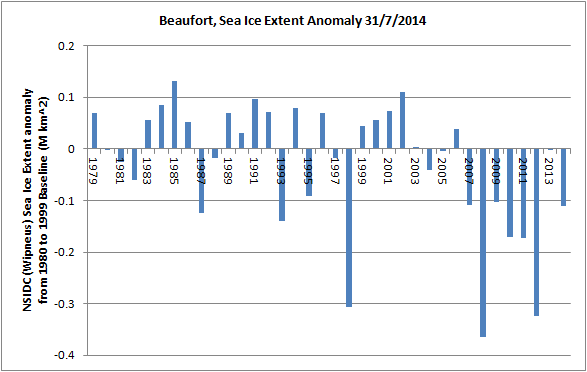 Beaufort is lower than 2013, and is comparable to much of the post 2007 period at the end of March. 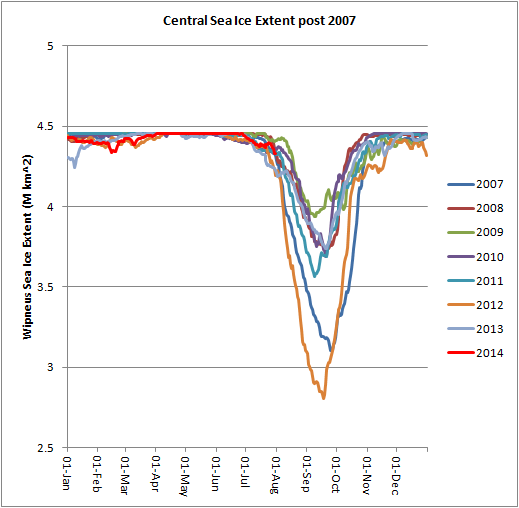 Moving around the the East Siberian Sea (ESS), 2014 is behind most of the post 2007 years. 2014 has some way to go to get to minimum extent for most post 2007 years, but decline is typically sharp at this time of year. 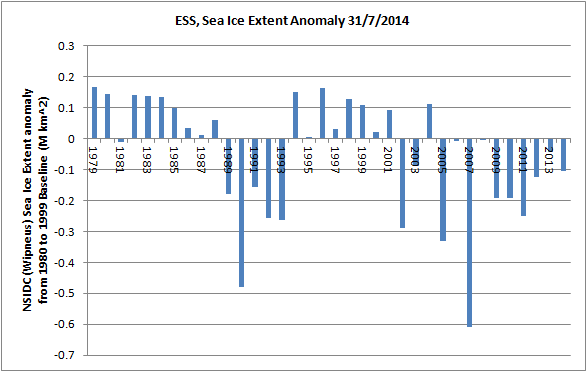 That noted I suspect it will not bottom out anywhere near zero extent, because of multi year ice (MYI) in the region. It's worth noting that as of 31 July Central Arctic extent is not unusual for post 2007 years, but 2013 actually had the second lowest extent, behind only 2012. 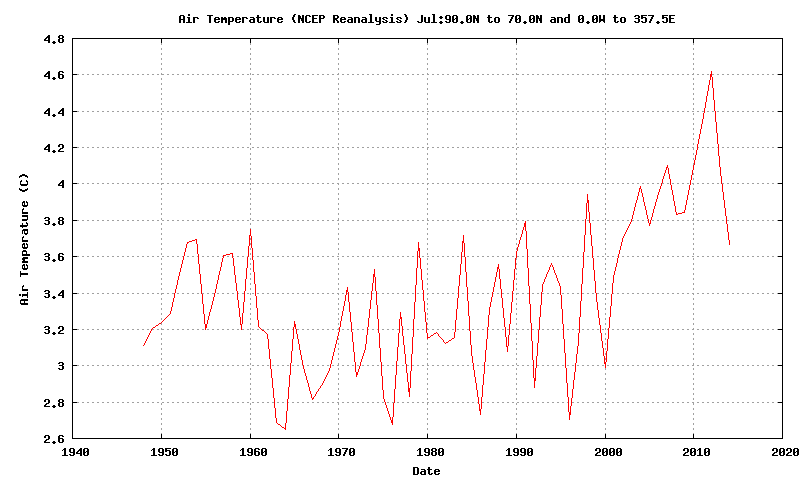 Were it not for the colder weather that dominated August 2013, things might have got interesting. 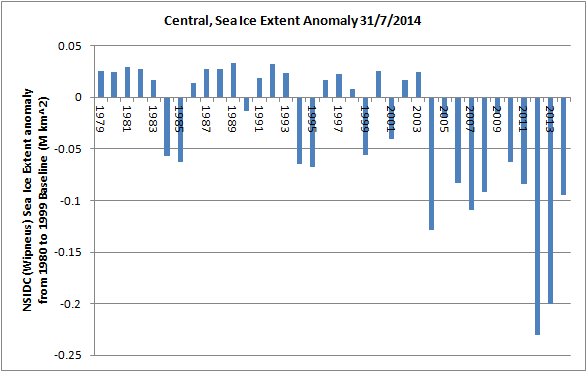 At present 2014 is starting slowly in the Central region, but declines through August can be steep. Declines on the Pacific edge of the Central region are not likely to be strong, but as HYCOM shows there is some potential for significant loss from the Laptev sea edge due to thinner ice in that region of the Central Arctic. 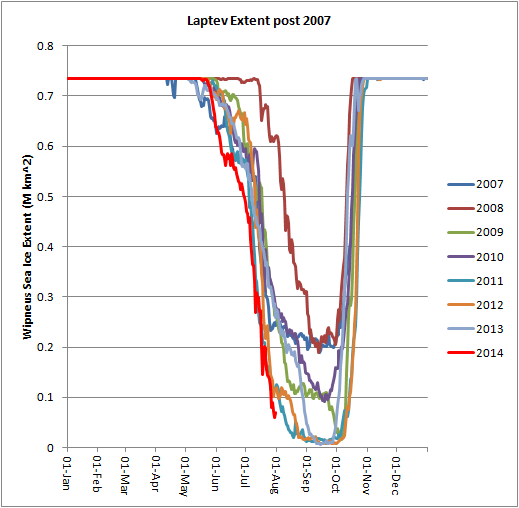 Meanwhile Laptev is virtually ice free, the lowest extent on record for that region at the end of July. 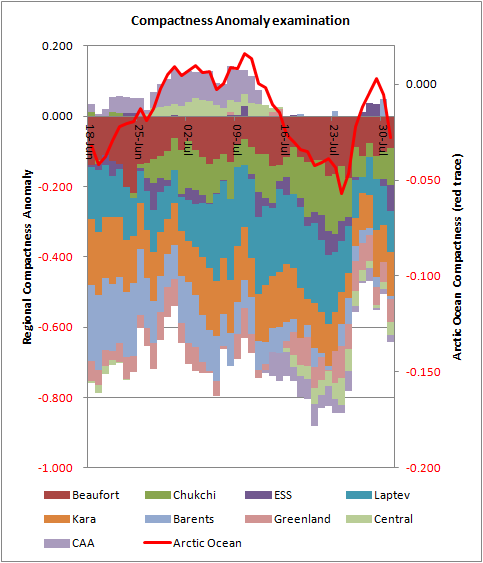 Moving to compactness (area/extent), having started the month higher than average compactness fell as compactness in the Central and Canadian Arctic Archipelago (CAA) regions fell below average. Compactness fell throughout most of July but went sharply upwards to more normal levels (for the 1980s and 1990s!) in the last week of July. Chukchi and Laptev played a role, the latter as ice extent neared zero and winds led to compaction of the ice. However these two regions are too small to strongly affect compactness for the entire Arctic Ocean. Beaufort and Kara played a role too suggesting widespread factors. I don't have a clear answer for this behaviour, but there was a large low around this time and for the five days preceding the pack was dominated by low pressure, for the five days after it was dominated by high pressure, with a low pressure centre of action over Kara and landward. However compactness on 31 July for the ESS was 0.584, you'd have to go back to 2000 to find a higher compactness (0.623). In April of this year I blogged about a large export of MYI being exported into Beaufort and said "a total melt out in Beaufort, Chukchi, and possibly as far as the East Siberian Sea, is looking unlikely. I suspect we may see persistent low concentration ice in those regions by late summer." Later in the spring I had concluded this wouldn't happen, I was wrong. HYCOM shows the tongue of MYI in the Beaufort, Chukchi and ESS regions, corresponding with the persistent lack of melt and high compactness evident in the ESS. Through August this feature will stall losses of extent and area in the Pacific sector. However that isn't the only issue explaining the poor melt of this year. 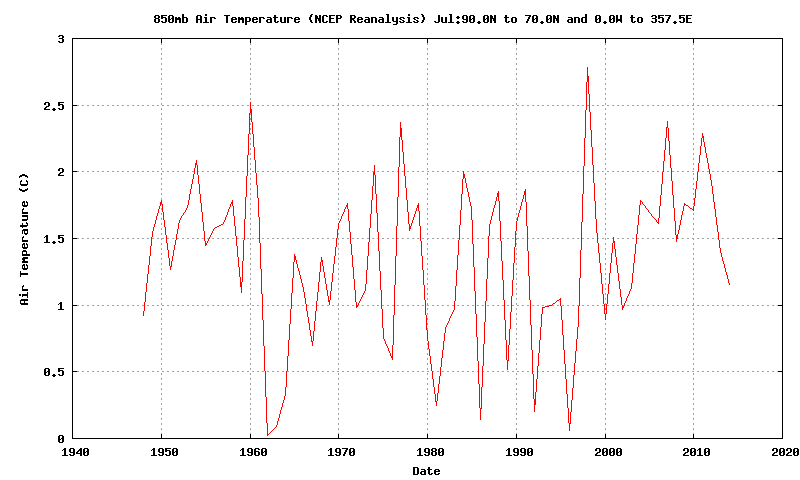 Here I refer to NCEP/NCAR timeseries and monthly composites, and correlations. July surface temperature north of 70degN has been colder even than last year, that however could be put down in part due to there being more ice. Moving up to 850mb however the same situation exists. Comparing the two images it seems reasonable to conclude that for the surface the large jump around 2007 is due to increased open water in July, this is less strong at 850mb (typically around 1400m above the surface north of 70degN). Something is making the atmosphere cooler in the last two years. It's worth looking at the spatial pattern of cooling, here I've plotted 2014 minus the 2007 to 2012 period, a period with a unique pattern of modified low AO index atmospheric set up (I still don't think that it's just a low index AO). When I plotted that the system prompted me that this plot is not dissimilar to the PNA pattern, that happens regularly at the moment! 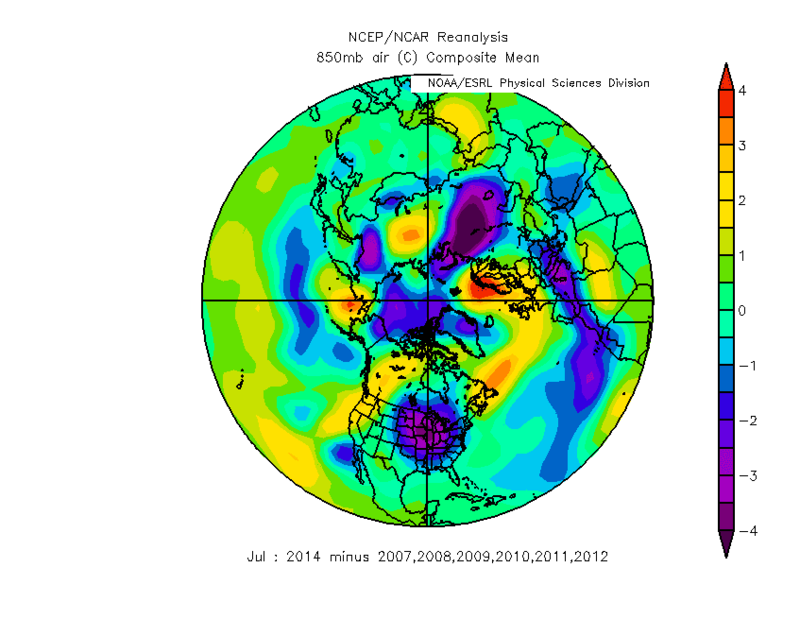 So I've regressed the July PNA against July 850mb temperature using the correlations page, and here is the result. There are differences, but there is some similarity. The cool across the north pacific, carrying on past the Kamchatka peninsula, the alternating high and low temperature blocks across Siberia are similar. Scandinavia is warm, when for a low index PNA it should be cool, and across the Arctic Ocean when the PNA is negative there should warming. So not perfect. Crucially is the behaviour over the Arctic Ocean, the negative regression values there should mean that when the PNA goes down, temperature goes up, and vice versa, so it would seem that the PNA has no role. But we have had two years of lacklustre performance in terms of sea ice melt, and cold temperatures which contrast with the preceding period 2007 to 2012. And since the second half of 2012 the PNA has been regularly tending negative in contrast with the positive behaviour preceding then (Climate Prediction Centre). So I think the PNA may be worth looking into as a possible cause of the cool temperatures in 2013 and 2014, despite the regression plot result. When I get the time I'll have a closer look. 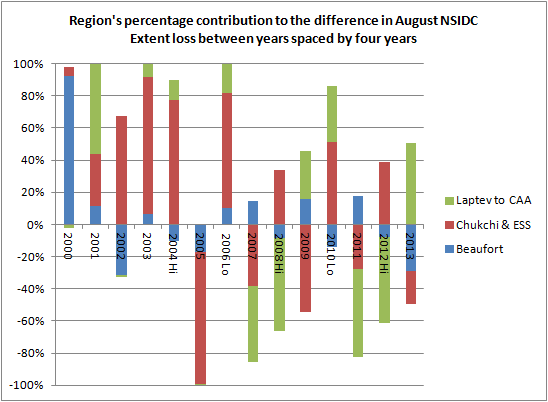 Returning to the issue of the MYI in the Pacific sector, it's worth looking a bit more closely at the losses in August. Losses from August to the daily minimum have been increasing (more negative), but there appears to be a cycle developing at the end of the series in recent years. 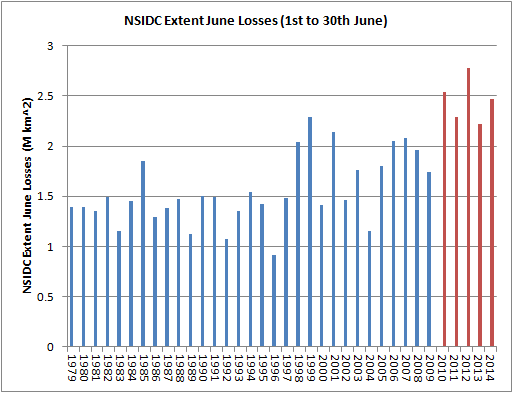 I've termed these losses August losses because losses in September are typically small, most of the losses are in August, and I've already used the term 'late summer' to refer to July through to the end of the melt season in September. There is an exact four year cycle between the peaks and troughs, 2004, 2008, and 2012 being years of high loss (the dips in the Arctic Ocean plot), 2006, 2010, and I suspect, now 2014 being years of low loss. This is a short period, it's possible it will amount to nothing. 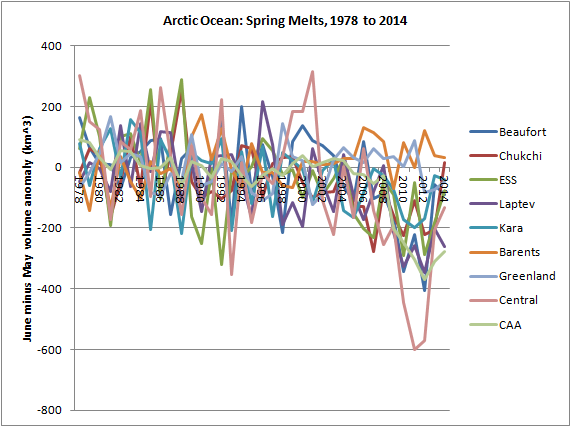 Having noticed the cycle in the whole Arctic Ocean data I plotted the above graph and concluded as much when I plotted the regions, there doesn't seem to be a pattern. However a four year cycle intrigued me, partly in light of how similar the MYI export of 2014 was to that of 2010, although it seemed harder to be so sure about 2006, but mainly because the bulk of the MYI seems to be getting to about four years old at the oldest. So I left the matter, but on reflection I decided to give it one more go. 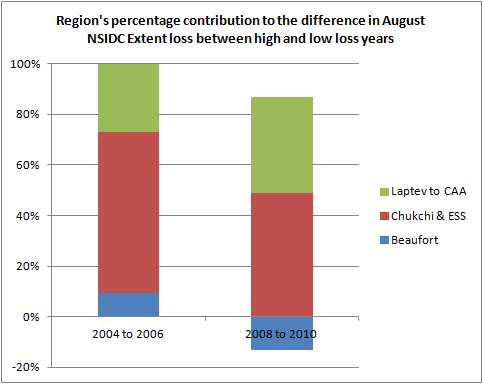 This time with a view to the differences between the high loss and low loss Augusts, and the role of Beaufort, Chukchi and the ESS in MYI export events. 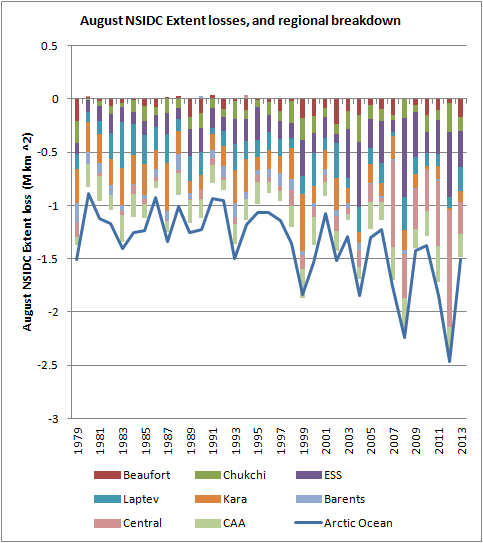 So I calculated the differences between successive two year periods in terms of August loss by region, tallied up Beaufort, Chukchi & ESS, and Laptev to CAA (the rest of the Arctic Ocean), and plotted them. I've labelled the years that seem to mark high and low loss years in the graph above as such. For example the plot for 2013 is the percentage contribution of the stated regions to the difference between 2013 and 2011's August volume losses. It's a bit of a mess, clearly something happens after 2005, but this is a result of the increasing August losses after that time, and the possible four year cycle. The couplets 2004 and 2006, and 2008, 2010, do seem similar. So here they are alone. What I take from this is that the difference in August extent loss between the highs and lows of the possible cycle in August volume loss is largely due to Chuckchi and the ESS, based on extent on 31 July of this year, 13% of the extent of Arctic Ocean sea ice contributes about half of the difference in August extent loss between the high and low year pairs of 2004/2006 and 2008/2010. Because of the MYI export into the Pacific sector I'm expecting this behaviour to exist once we have the September daily minimum extent data in (2012/2014). So I expect this pattern to hold, but that won't convince me it means anything. If the pattern persists in the 2016/2018 data it might be meaningful. The myth of the post-2010 low PIOMAS volume "era" is now officially disproven. 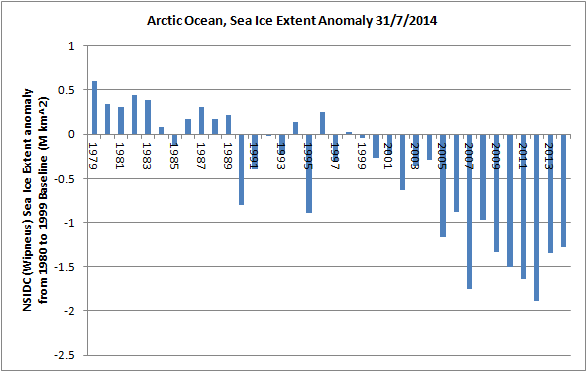 We have large fluctuations super-imposed upon a long term ice loss. There is no such thing as the post-2010 era. Which is not of course to say anything about when we'll get to ice free summers, just that there wasn't really anything special about 2010 and there is no true tipping point. 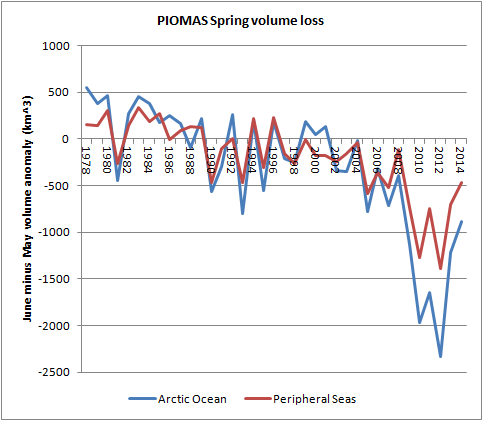 "The myth of the post-2010 low PIOMAS volume "era" is now officially disproven." What about the increased spring volume loss in every year since 2010 including this year and last? 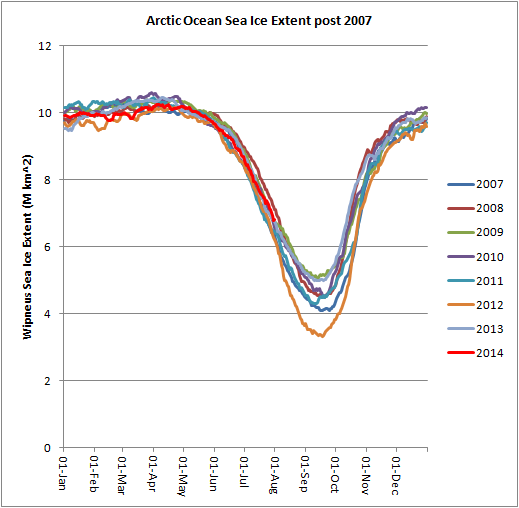 What about the drop in average thickness and drop in volume from thicker ice that followed 2010? What has happened is that poor melt weather, very different from the 2007 to 2012 average, has led to poor melt and the survival of a lot of the MYI from last year. 2010 was never a tipping point, it was a volume loss year, an important one, but just that. Now it has been wiped out by this year's poor melt. We wait to see if there will still be an aggressive spring melt next year (I suspect not), we know what will happen again when the volume drops below 2010 levels due to large loss of MYI in the future. 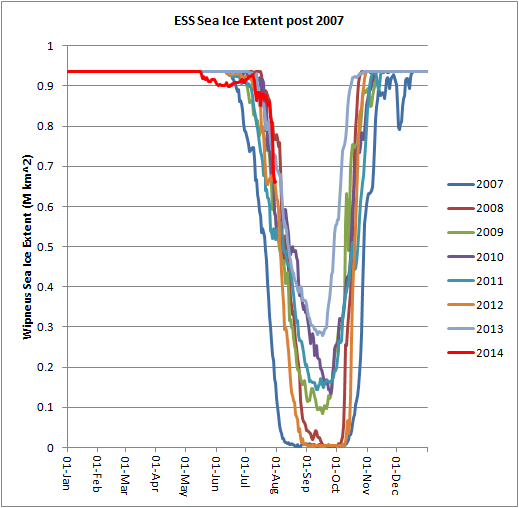 Anyone still expecting a rapid crash of the ice by 2016 is going to be disappointed. But this doesn't change the basics. It does however mean I will probably have to wait a few years to see peak volume hit around 19k km^3 again. Ho hum. Even 2007 and 2009 had a spring volume anomaly drop about equal to this year's. That's why I say there is no post-2010 era. Consider the June minus May version of the Spring volume loss. Yes there were dips in 2007 and 2009, but they are dwarfed in 2010 to 2012. Then consider the regional breakdown. What happens in the Central Arctic is highly unusual!